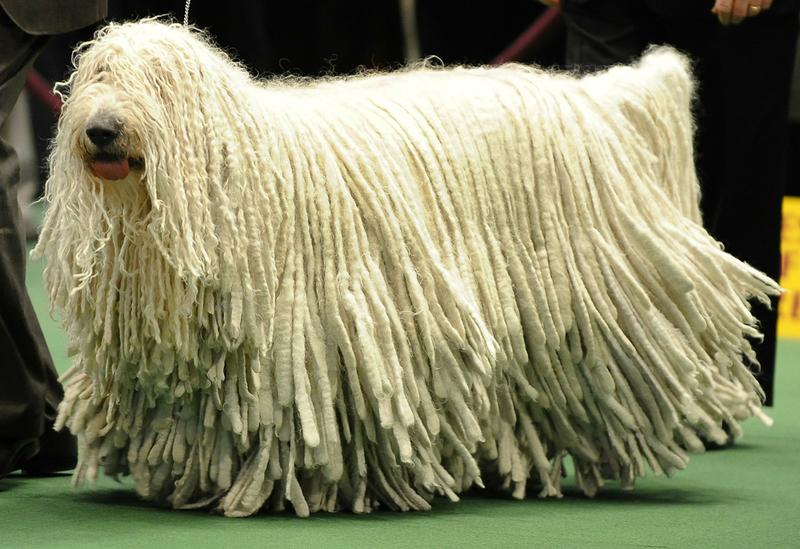 This week was the 2014 Westminster Kennel Club dog show. The Best-in-Show winner was “Sky,” a wire fox terrier, which apparently is a kind of dog. I realize this is not exactly the kind of thing most bikers are interested in, and it makes easy fodder for satirists. It is easy to laugh at people fawning and and investing massive amounts of time and money into these animals, which are bred out onto the thinnest branches of the evolutionary tree and would be perfectly incapable of surviving in the wild. Seen from the outside, it’s ridiculous. It’s like a modern version of Dutch tulipmania. Here’s the thing: how different is this, really, from some of the “Biker Build-Off” competitions? You have masses of connoisseurs poring over the fine points of rare, exotic breeds that bear little resemblance to their useful ancestors. 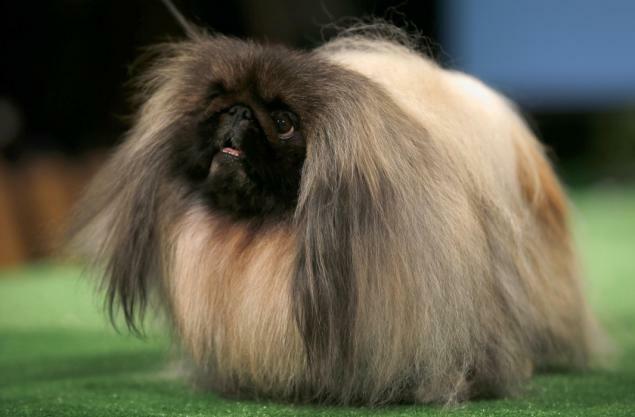 At the dog show, they’re in tuxes; at the build-off, it’s leather, but either way it is a socially enforced dress code. Yes, it may seem ridiculous from the outside, but from the inside it is serious. If you know what you’re looking at, you see these things differently. You can easily become a snob, whether it’s about dogs, custom bikes, wine, classic rock & roll, or calligraphy. When something spirals off in its own direction, it can start to take on these strange forms. It’s like the evolutionary isolation of Australia and the resulting array of deranged fauna, or a language group that gets isolated from its mother tongue until the two are no longer mutually intelligible. Things get over-the-top fast. We end up with weird plumage, duck-billed dinosaurs, and slithering lichens. The genes that are being selected and passed on in these show bikes are not related to riding and function, but the genes for showmanship, which then get inbred and multiplied. That’s why we have bikes that are “just rolling sculpture” or “unrideable” that so many people complain about. These are show chickens, not fryers. 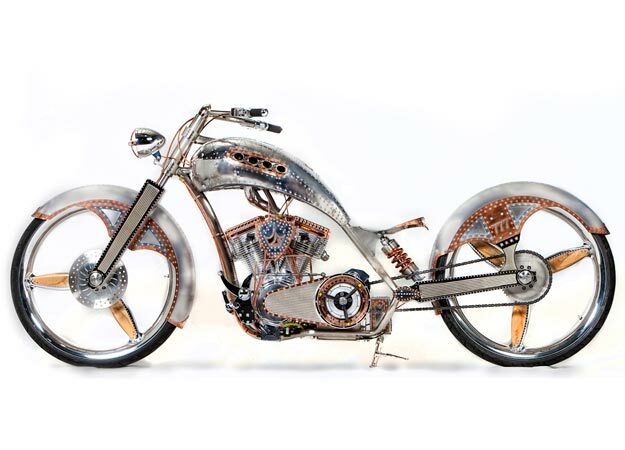 Certainly, there are show bikes that buck this trend, but even those we tend to judge as artwork. Few things are as beautiful as a purebred Alaskan Malamute or a fine custom bike like the Little Blue BMW, but these are the examples that still show the earnest bones of their hardworking ancestors. It’s the Lancashire Six-Legged Glass Dog or the Exxxtreme Dragon-Chopper that are the hothouse flowers that die in the sun. Connoisseurship itself breeds these outliers. Contemporary philosopher Randall Munroe described this phenomenon elegantly in XKCD #915. Of course we want to become connoisseurs of the thing we love, but sometimes I just want to drink my damn wine in peace. 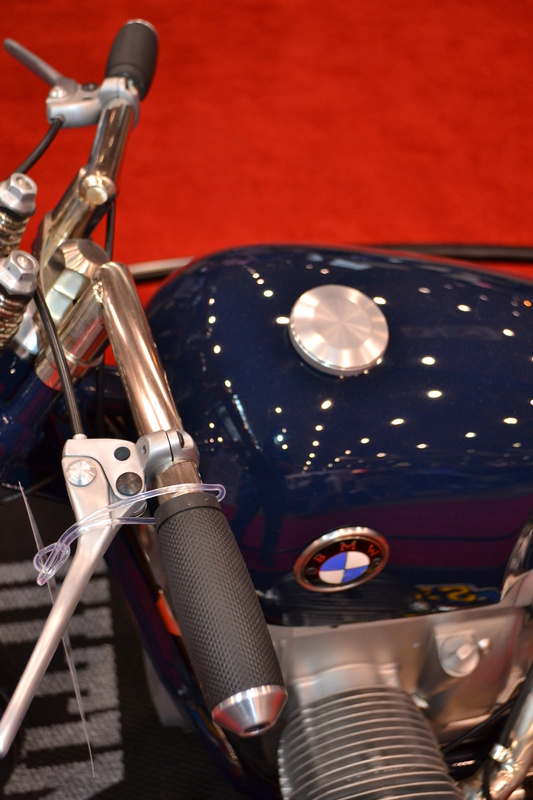 The Progressive International Motorcycle Show is making its way across the country. 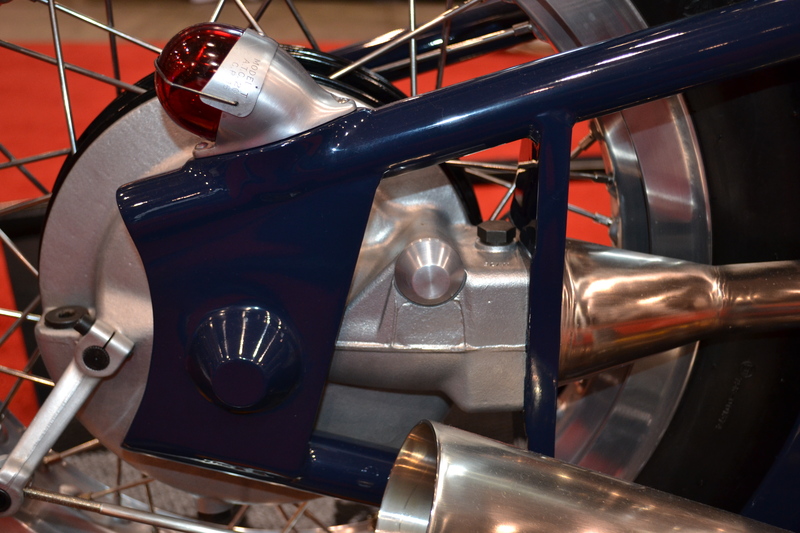 While most of the show is predicable and repetitive from year to year, many of us enjoy perusing the J&P Cycles Ultimate Builder Competition. We should always be skeptical of anything that call itself “Ultimate,” but it is gratifying to see the results of various builders’ dedication of time, talent, and materials to their machines. 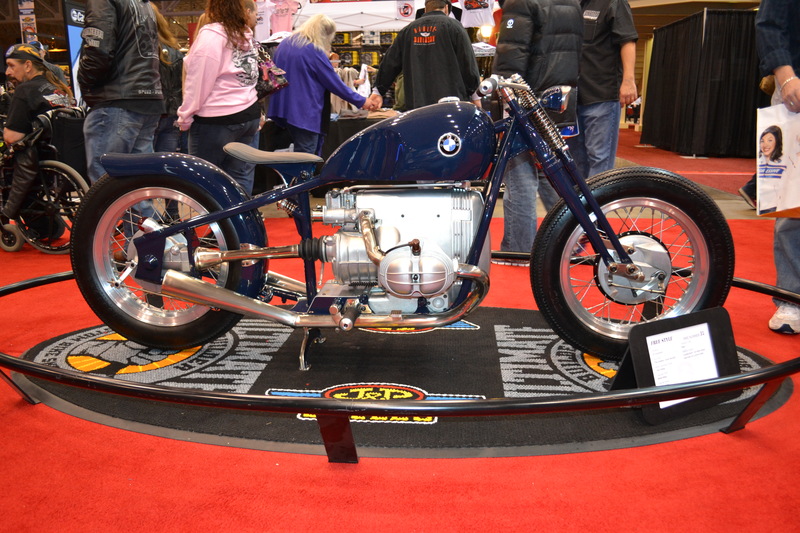 This year, the bike to see is the little blue BMW by Jesse Bassett of the Gas Box. This perfect sapphire is radically different from anything else in the competition: radical in its elegance, proportion, and simplicity. Simplicity is not simple. In a minimalist design, everything must be correct. The design intent must be expressed with only a few notes, as the designer does not have ornament to rely on. While most build-off bikes tend toward over-the-top baroque ornamentation, it is a daring move to pare a bike down almost to the Platonic essence of bike-ness. 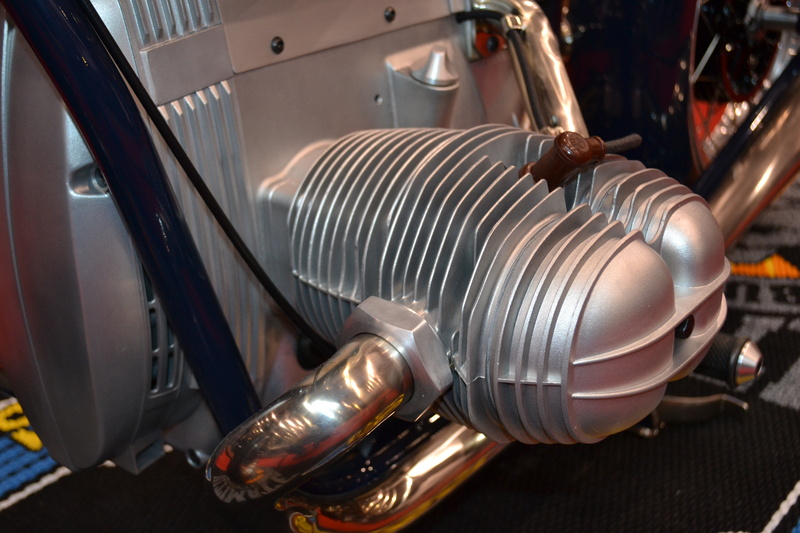 Every joint is exposed; every weld, seam, or bend is out there and must be labored over to become pure geometry. This is putting it all on the line – fabricating without a net. Not only the workmanship, but the design fundamentals are also ruthlessly laid bare. The overall proportions, shape, and lines of the composition absolutely must be right, and they are. The bike is compact but open, like a talented bantam-weight boxer, tough and low. Sinewy. None of the pimpish trappings of a professional wrestler. This has to be planned from the beginning – there is no going back and covering up the fundamental form of the bike. That means the builder needs both the ability to envision the unbuilt and the talent to turn vision into steel. 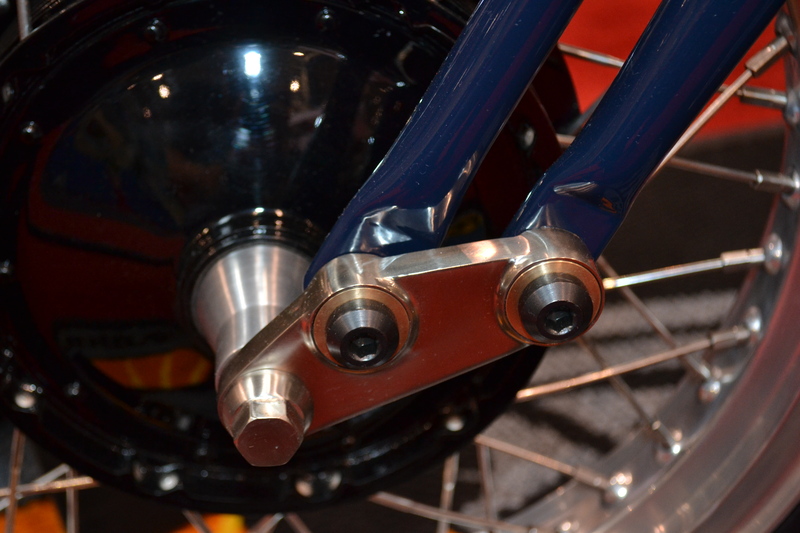 Although it is a minimalist design, for the careful observer this bike is full of little delights. 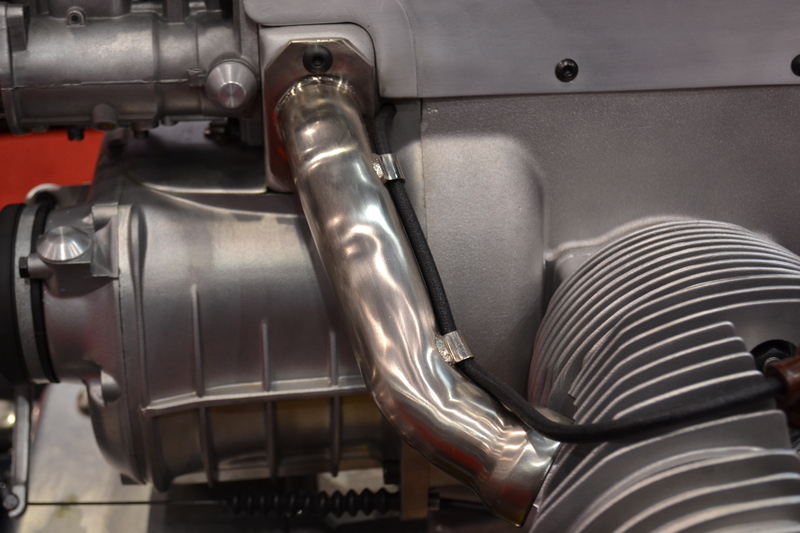 For example, the little clamps for the spark plug wires running along the intake pipes, which help to visually keep the engine clean. 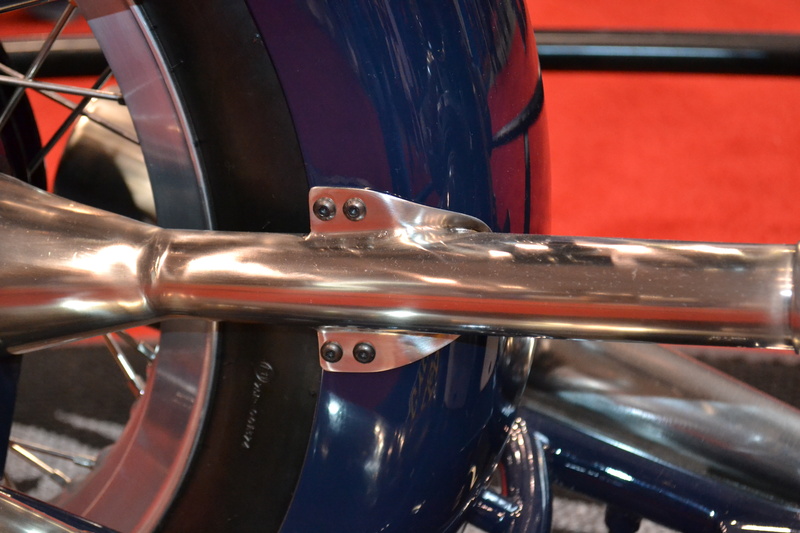 Also, the neat attachment of the driveshaft cover to the rear fender, which only works because this is a hardtail, is a tidy move. The footpegs that are identical to the handgrips create a nice symmetry. The bike is also a feast of finishes. Various platings and polishings provide subtle variations in sheen, warmth, and brightness of different bare metal components. No exposed material is overlooked. 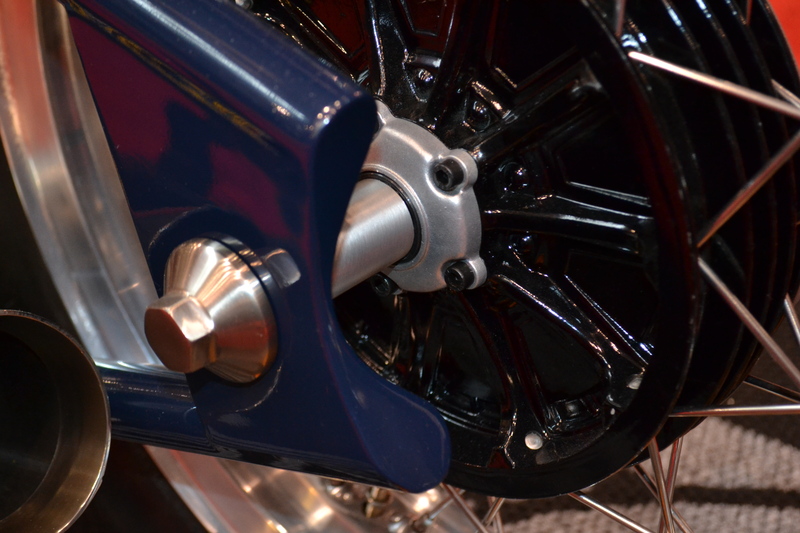 The blue paint – devoid of any pinstriping or embellishment of any kind – is both the perfect color selection and flawlessly applied. It is always a treat to see all the custom builds, which are such personal statements and represents large investments in time and treasure. 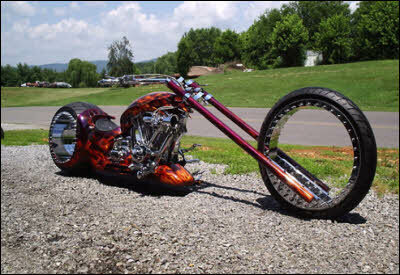 It is a special moment to see those bikes that really raise the level of artistry in the builder’s craft. This bike is one of those.